The Universal Exhibition, also commonly known as Expo, has been founded to provide the perfect stage to show off the most ambitious successes that man has achieved over time. As Expo 2015 host, Milan has chosen to bring in the world’s public spotlight the pressing theme of feeding the planet in a healthy, safe and sustainable way. 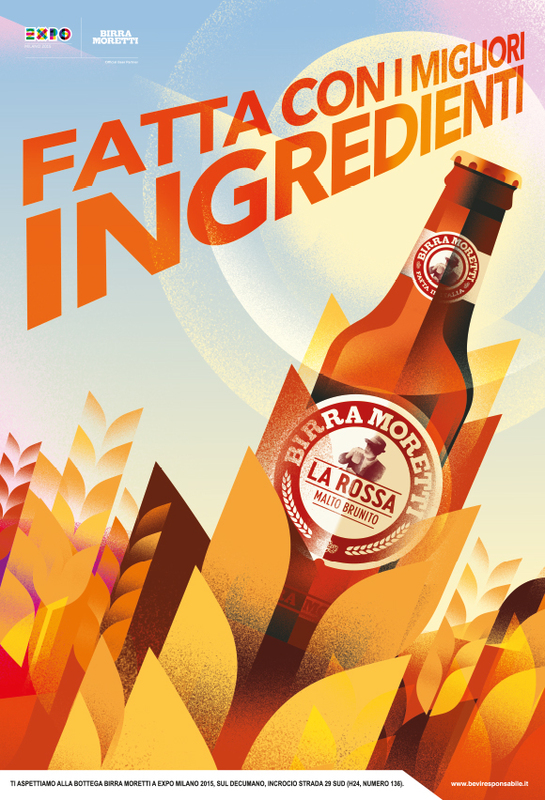 Expo Milan is literally becoming the world’s biggest restaurant and Moretti, as the Official Beer Partner of Expo, is focusing its presence on its key values of quality, sustainability and Made in Italy. 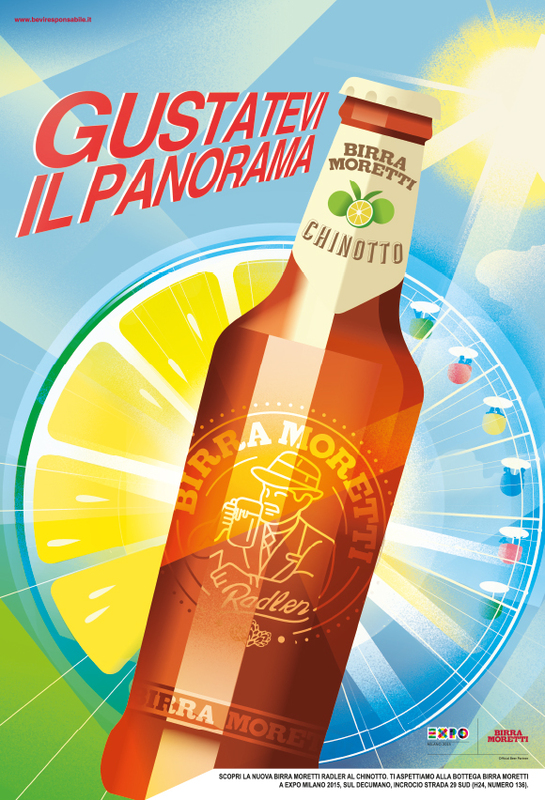 For the occasion Moretti’s advertising agency Armando Testa created a print, digital and OOH campaign that references Italian futurism re-visited with a contemporary sensibility and Machas was involved to manage the talent that would bring to life such vision. After discussing with Armando Testa different visual options, Machas commissioned Danish illustrator to work on the six images released over the six months duration of Expo. 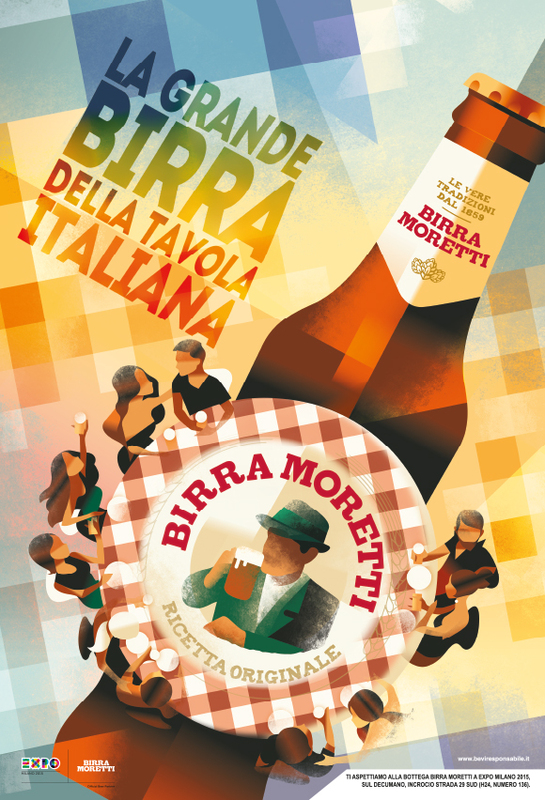 Moretti asked a campaign that everybody could hang at home, graphically appealing and meaningful as the vintage poster advertising. Based on our brief, Machas rapidly suggested a list of artists among them we found the right one. We worked closely with Machas and Mads, dealing with emergencies, changes, sleepless nights and countless phone calls with Valentina (also on Saturday night and yes, even at two in the morning! 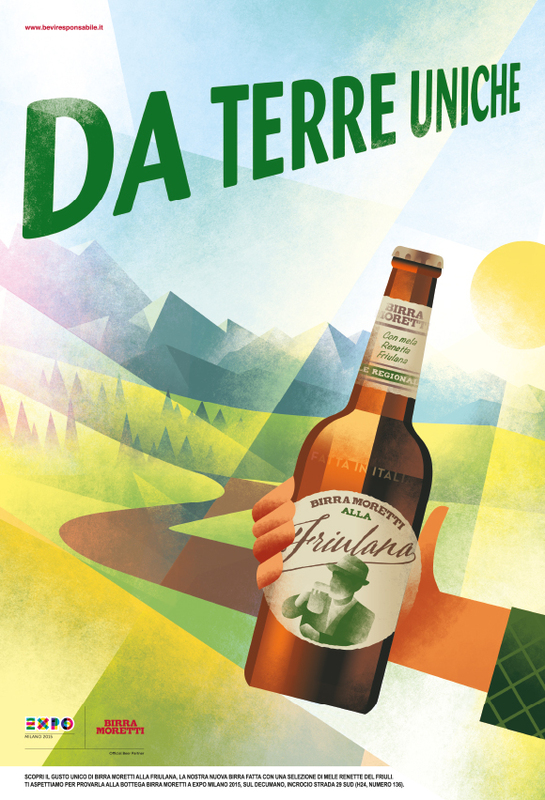 ), we have produced a strong campaign and people are still asking to buy a poster size to have it at home. 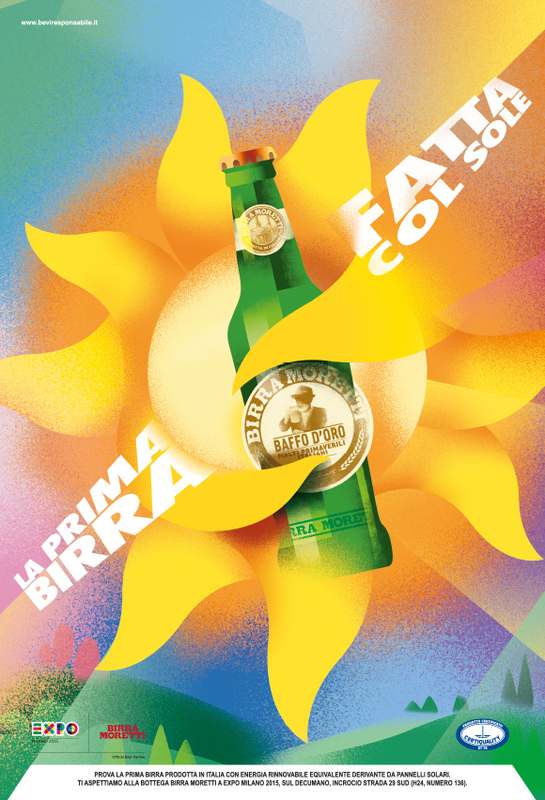 Thanks to his immediately recognisable shading technique, geometric composition and bright, modern colours, Mads worked closely together with the creative team to develop a series of striking images, each one of them featuring the Moretti bottle as a perfect complement of the scene. 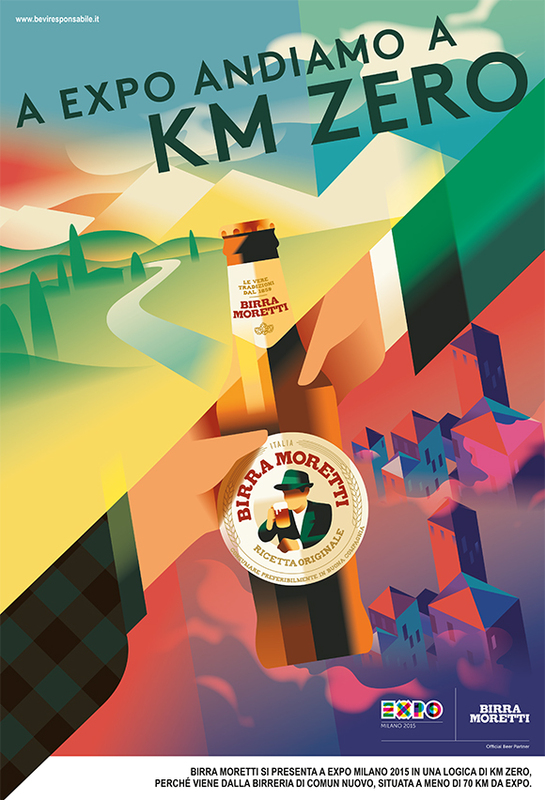 Adjusting his color palette to the warm, saturated nuances of the Italian landscape Mads perfectly captured Moretti’s long standing tradition as well as projecting the brand into the future. When working together for months at such a fast paced, it was great to still be able to smile in stressful situations. Thanks to Valentina we were always able to mediate and to work without too many difficulties. Machas has been an important partner and was able to put together an advertising agency like us with an artist, even though we didn’t always have the same vision. This project was not only a great professional experience, but it gave me a big satisfaction from a human point of view, because of our collaboration with an excellent artist and the strong bond we created with Machas.